LOS ANGELES — Steve Alford fervently believes Tony Parker plays better when he's angry, so the UCLA coach didn't waste his chance to needle the affable big man before Thursday night's game against Stanford. 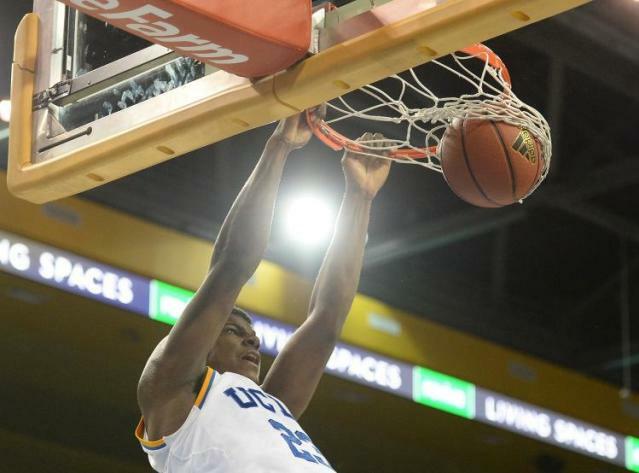 When Parker entered the UCLA basketball office earlier in the day clad in a red T-shirt, Alford poked fun at the sophomore for wearing the color of both the Bruins' opponent that night and their biggest rival. "You've got to make Tony mad," Alford said with a smile. "He had a really ugly outfit on. He wore red in our office, and that's just something you don't do. Make fun of his outfit a lot and that bothers him." Expect Alford to keep ribbing Parker before games if it keeps producing results. Parker came off the bench and scored a career high 22 points on 9 of 14 shooting, leading UCLA to a comfortable 91-74 home win over previously surging Stanford. The key to Parker's success against a potent Stanford frontcourt was his activity level and his ability to finish at the rim. Several of his baskets came on put-backs. A couple others came via nifty moves in the low post. The majority were dunks or layups made possible when one of UCLA's guards beat his man off the dribble and fed Parker after his defender rotated over to stop the ball. "He played with really good energy and urgency both defensively and offensively," Alford said. "I just thought he was active. He ran the floor. He posted hard. He got to the free throw line. He did a lot of good things. That's good to see because we need that low post presence." If Parker were able to consistently match the energy he displayed Thursday night, there's a good chance UCLA might be a top 15 team and a viable challenger to Arizona in the Pac-12. The Bruins have an array of skilled perimeter players capable of knocking down outside shots, scoring in transition or attacking the rim in half court sets. What they have so far lacked is an imposing big man capable of protecting the rim, gobbling up rebounds and providing low-post offense. Parker is the player on the roster most capable of delivering in those areas, but the former four-star recruit is still a work in progress after playing sparingly as a freshman. The Georgia native averaged only 2.4 points and 1.2 rebounds in 6.4 minutes per game as a freshman. Having shed 25 pounds during the offseason in order to stay on the court longer without getting winded, Parker has played a far bigger role as a sophomore. His minutes and production have tripled, though he tends to be inconsistent, following a handful of quiet games with a huge scoring night. In the second game of the season against Oakland, Parker notched 21 points and 12 rebounds, but he scored 10 or less in each of his next nine games. In a non-conference matchup against Alabama in late-December he had 16 points on 6 of 7 shooting, but he has been fairly quiet in Pac-12 play before Thursday. Why the huge game against Stanford? Parker attributes it to film he watched film of Kevin Love this week. "I tried to stay around the arc (in the paint) and stay active," Parker said. "A lot of balls came to me." When the final buzzer sounded, UCLA coaches waited by the end of the bench to high five players as they jogged to the locker room. In each case, the heartiest congratulations were reserved for Parker. Parker got a chuckle out of Alford's criticism of red shirt but the big man doesn't think much of his coach's fashion sense. "I'm one of the most well-dressed players Coach Alford has ever had," Parker joked. "Some of my outfits are (after) his time. He's coming from Indiana. It's a little slow there." Maybe Parker's look really was too fashion-forward for Alford. Or perhaps there was an ulterior motive behind the ribbing.